SteadyPay’s core service is topping up pay. The top-ups allow you to continue to receive your usual pay when it would otherwise take a hit due to taking time off or roster changes. Setting up the top-up service is simple. On the app, link to the bank your pay goes into. SteadyPay identifies your employer and works out your average pay. Then everyday payday it checks to see if you need a top-up. 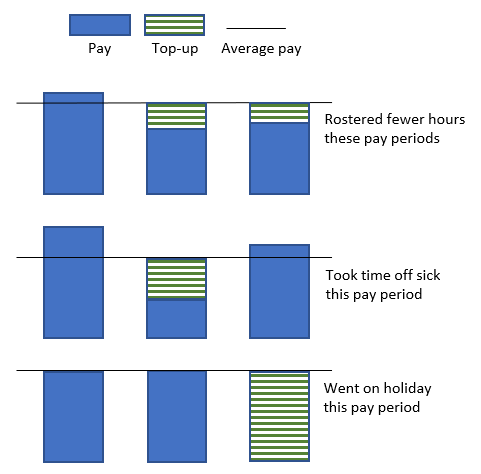 If you’re paid £25 or more below your average pay, you qualify for a top-up. You’ll get a notification on your mobile phone asking if you want the top-up. If you respond yes, the money will be deposited into your bank account by the next day. You can opt to decline a top-up. And if you don’t respond to the notification, we assume you don’t want the top-up. There’s a credit limit. You continue to receive top-ups so long as your balance (the amount that needs to be repaid) remains within the credit limit. You also need to be up to date in your top-up repayments and subscription payments. That’s it! A simple and effective way to protect your pay.